Growing peony plants may reward the home gardener with large, showy blooms, but if you don't provide them with exactly what these finicky plants want, peony problems will all but certainly occur. For this reason, it is essential to have the best peony flower care available. We can help with that. The following information provides tips and solutions for common issues with peonies. The nodding behavior of peonies may be due to the big blooms, but it could also indicate the plant needs water. Do you know how much to water peonies? If not, click on the following article for tips on optimum peony irrigation. Peonies form interesting, clusters of wedge-like gray to brown seed pods, covered when young with a slight fuzz. They can add interest to the garden and allow you to harvest seeds for peony propagation. Click this article for tips on collecting peony seeds. Even if you are a fan of this popular perennial, you may not have realized that there are several varieties of pink peony flowers. From bright pink to pale, almost white pink, and everything in between, you have your choice of pink peonies. Learn more here. Red peony plants make an especially dramatic showing in flower beds, with shades ranging from tomato red to burgundy. Red peony flowers will definitely wake up your garden. For information on red peony varieties and tips on planting red peonies, click here. If you?ve grown peonies, you have probably dealt with peony leaf blotch (a.k.a. peony measles) at some point. In this article, we will discuss this common disease of peonies, as well as give tips on controlling peony measles. Click here for more information. Peonies are an old-fashioned favorite in the garden. However, like all plants peonies can still have their share of problems with diseases and pests. In this article, we will discuss common afflictions that cause spots on peony leaves. Who doesn?t enjoy brushing aside winter mulch and garden debris to see what little plants are poking up through the soil? In many locations, the red-pink shoots of peony plants are one of the earlier signs of spring. Click this article to learn about spring care of peonies. With so many varieties of peonies available these days, selecting the right peony for your garden can be confusing. Add terms like tree peony, itoh peony and herbaceous peony, and it can seem overwhelming. This article is specifically about growing tree peonies. Peonies are popular garden plants with both herbaceous and tree peonies available. But there?s also another peony you can grow - hybrid peonies. Click this article to learn more about Itoh peony types and growing hybrid peonies. Peonies are blowsy old-fashioned favorites. Container grown peonies are excellent for the patio but they require a little more care than in ground plants. Choose a big container and come with us to learn how to grow peony in a container. 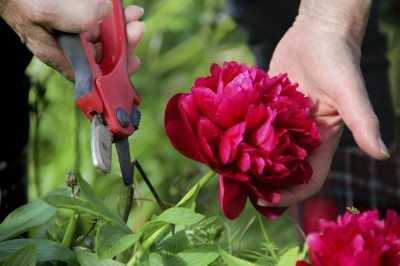 Peony Pruning: Is Pruning Of Peony Necessary? Pruning peonies is easy, and they often require no pruning at all. So how do you know when to trim peonies? Read this article to find out more about when and how to prune a peony. Peony flowers are large, showy and sometimes fragrant, making them an essential in the sunny flower garden. 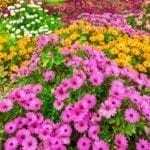 Foliage lasts all summer and is an attractive background for other plantings. Get care info here. Are your peony leaves turning white? 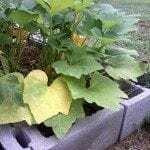 It?s likely due to powdery mildew. 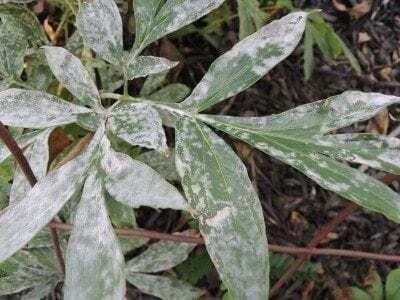 Powdery mildew can affect many plants, including peonies. Read this article to find out what can be done about this issue. If you wonder about dividing peony tubers and expect them to grow, there is an appropriate way of propagating peony plants that you should follow if you expect to be successful. Learn more here. 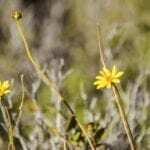 In any gardener's flower bed, plants can be subject to damage. When it happens to a peony plant, the damage is even more frustrating because of the picky nature of peonies. Learn more about that here. The peony is like the grand matriarch of the garden. It knows exactly what it wants, and if you don't provide it with exactly what it wants, a peony will cause problems. Non-blooming is one. Learn more here.